To address these cleanliness requirements, Hunt Valve Actuator Division developed two special food-grade versions of its Victory A-Series line of ram-style EMAs. The FG1 model adds food-duty epoxy paint over an anodized aluminum body, food-grade rod wipers, seals and lubricant, as well as an inner ram (thrust rod), rod ends, and hardware that are all made of stainless steel, to the standard Victory-A Series design. In addition to the features of the FG1 variation, the FG2 variation has a full 300 series stainless-steel exterior that provides an extra level of protection against the most corrosive environments and cleaning chemicals. The body design of the FG2 variation also eliminates corners, seams, and crevices where bacteria, water, or food particles could collect. Two recent inquiries illustrate some types of applications for where these food-grade actuators are appropriate. A major producer of processed meat products needed assistance in sizing and configuring two food-grade actuators for transferring large “logs” of cold cuts into a refrigerated storage area. This application required custom modifications to the units to allow them to be mounted properly. The first unit lifted a platform that held the second unit and the logs of cold cuts. When the first unit reached the proper position in the storage area, the second unit would push the logs into their designated cells for storage before moving onto slicing and final packaging. The second customer’s application involved clamshell packaging of pre-washed lettuce. The unit, which is mounted on a conveyor line, prepares the lettuce in the bottom half of the clamshell for the top half to be applied. This application involved a notably aggressive duty cycle, and required modifications to the unit’s rod-ends and other components to eliminate issues they were experiencing with their current linear solution. Food-grade actuators have also been adapted for a variety of other applications, including production and packaging in pharmaceutical cleanrooms and semiconductor fabrication facilities. Stainless steel versions are also ideal for use in marine environments where the actuator could come in contact with corrosive salt-water spray, such as ship’s rudder control or the lift davits used to deploy lifeboats. To learn more about how Victory-A Series food-grade actuators can be put to work in your specific application, Contact us or download our free guide, How to Select the Appropriate Electromechanical Actuator. 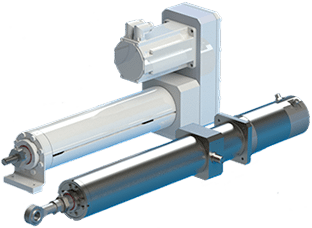 Tag: electromechanical actuators, Linear Motion Solution, "Food-grade actuators"